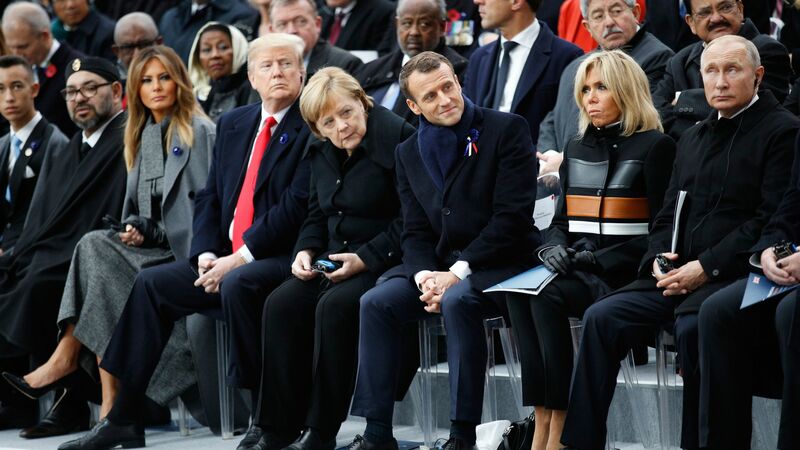 President Emmanuel Macron seemed to many to be speaking for Europe, even the free world, when he denounced nationalism as the “opposite of patriotism” and the enemy of peace and morality as President Trump and Russia’s Vladimir Putin looked on. He wasn’t. Why it matters: Trump’s antagonism toward Europe, and his immense unpopularity there, would seem to offer Macron the ideal foil as he seeks to shepherd the EU into a new consensus that security threats from the likes of Russia, economic competition with giants like China and the unreliability of the U.S. necessitate a strong, unified Europe that can throw its collective weight around. But the nationalists on his own continent are undermining that vision — and they have a powerful friend in Washington. The big picture: Saturday’s remarks were part of what Macron sees as a battle for the soul of Europe with nationalists like Hungary’s Viktor Orban and Italy’s Matteo Salvini. And it's increasingly clear that, on that front, Trump is far from an ally. The only European country Trump praised in September’s UN General Assembly address was Poland, which he said was fighting for “sovereignty.” Poland was also fighting the European Commission, which a day earlier had formally accused it of undermining the independence of the judiciary. One senior Western European diplomat recently grumbled that the only European ambassadors in town who can get a meeting at the White House are from Poland, Hungary and Italy. Belin says Trump’s “clear favoritism” for those countries can exacerbate the divisions between them and Brussels, or Paris. Macron knows that the more he tries to pull the EU together, the more he pushes some members away, and the more he risks isolating himself. He may, therefore, press pause on the most ambitious aspects of his European agenda. The bottom line: “Macron wants to be a strong leader that Trump disagrees with but respects for being strong,” Belin says. He doesn’t simply want to stand against Trump, alone. North Korea has been making improvements to 16 hidden ballistic missile bases even after moving to dismantle a major site to appease the U.S., the Center for Strategic and International Studies reports, based on satellite images. "The existence of the ballistic missile bases, which North Korea has never acknowledged, contradicts Trump’s assertion that his landmark diplomacy is leading to the elimination of a nuclear and missile program that the North had warned could devastate the United States," per the NY Times. Five months on from the Singapore summit, sanctions on North Korea remain in place, but Kim Jong-un's regime is less isolated and seems emboldened. Pyongyang threatened last week to resume nuclear development if it doesn't get sanctions relief, before skipping a meeting with Secretary of State Mike Pompeo. The bottom line: Kim isn't testing missiles or threatening nuclear destruction. He's also not doing anything that indicates he's serious about denuclearization. President Trump, for the time being, seems satisfied with that state of affairs. He's planning to meet Kim again early next year. Turkey sits at the geographic center of some of the United States’ most pressing foreign policy concerns, including the Syrian civil war, Iran sanctions, Russian aggression in Europe and Eastern Mediterranean stability. Turkey opposes the U.S. on these issues: Turkish leadership wants to change the regional order that facilitates the exercise of American power in Ankara’s neighborhood and has taken steps to undermine American policy. The two countries' interests do not align. They're divided over Syria, Ankara’s ties to Moscow, the fate of Fethullah Gulen — the alleged mastermind of the failed 2016 coup attempt — and the detention of Americans in Turkey. What to watch: The last time international sanctions were imposed on Iran, Ankara helped Tehran evade them, and Turkish-Iranian trade initially increased. Even though the Trump administration granted Turkey a waiver to continue to buy oil from Iran, Turkish President Recep Tayyip Erdogan has been vocal in his opposition to U.S. policy. Given Turkey’s track record, it’s possible that Turkey will once again help Iran work around sanctions. Go deeper: Read the full CFR report. Belief in democracy is eroding across Latin America, where 71% are dissatisfied with how democracy works and only half believe it's the best form of government, according to a Latinobarómetro survey of 18 countries published by the Economist. 15% believe authoritarianism is best, while 28% are neutral — up from 16% in 2010. Satisfaction with democracy is lowest in Brazil, which just elected far-right firebrand Jair Bolsonaro, who has expressed admiration of military dictators. Confidence in government and the courts is low. "Only the armed forces and the church, powerful institutions before the advent of mass democracy, retain much respect." Faith in democracy is higher in countries where it is being dismantled (Venezuela, Nicaragua) and those where it has brought relative prosperity (Uruguay, Costa Rica, Chile). It is lowest in Guatemala, Honduras and El Salvador. How we got here: Economic growth has slowed and concerns about safety have grown. So, too, has outrage over corruption. What to watch: "The young are more skeptical than the old, which bodes ill for democracy’s future." People in Japan believe robots are coming for their jobs and will yield a more unequal society where it's harder to find work, according to a Pew survey. By the numbers: 89% believe robots will do "much of the work" humans do today within 50 years. 83% think that will widen the gap between rich and poor, 74% think unemployment will grow and just 35% believe robots will create "new, better-paying jobs." The big picture: The vast majority in Japan are pessimistic about where the economy is headed. While 44% now say the economy is "good," up from 7% in 2012, just 26% say things are better than they were 20 years ago, and a mere 15% say today's children will be better off than their parents. The bottom line: It's not just about robots. Japan is facing severe demographic challenges tied to its aging and shrinking population. And while immigration is rising, it remains low. Just 23% would like to see it increase, while 58% say it should remain the same and 13% say it's already too high. Still, 59% say the immigrants currently in Japan "make our country stronger." Alibaba keeps shattering its own records on Singles Day (11/11), the Chinese equivalent of Cyber Monday, Axios' Erica Pandey writes. This year the e-commerce titan raked in $30.8 billion in 24 hours, easily besting last year's record of $25.3 billion — and $10 billion of that was earned in the first hour of sales. But the tech giant — and other Chinese e-commerce companies — may be peaking. The rate of Singles Day profits growth is slowing down as internet penetration in China races ahead and the number of brand new online shoppers logging on each year falls. Erdogan says he gave audio of Khashoggi's killing to U.S. Into vain citadels that are not walled." — Wilfred Owen, the British soldier and poet who died a week before the end of World War I, from "Strange Meeting"